"The Sacrifice" DLC for Left 4 Dead 2 coming next week. The Sacrifice DLC for Left 4 Dead coming next week. The Sacrifice DLC for Left 4 Dead will be launched next week and will feature a totally new chapter in the game. The DLC will tie in the original game to “The Passing” DLC which was released earlier this year and will show the original four characters from Left 4 Dead and will show from their perspective of the story as they advance Southwards. The DLC will also reveal a new gameplay mode named “Sacrificial Gameplay” where one player will sacrifice himself to save the other team mates. The DLC will be released for both Left 4 Dead 1 and 2. For 1 it will add the new campaign including maps that will be playable in Versus and Survival while Left 4 Dead 2 players will also get the same as 1 with some added bonus which will add the “No Mercy” campaign from the first game and will also feature new items and weapons from Left 4 Dead “Special Infected”. 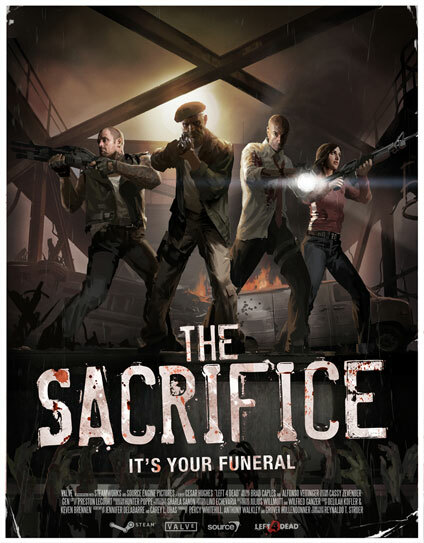 Releasing on October 5th, The Sacrifice DLC for Left 4 Dead will be available for 560 Microsoft Points on Xbox 360 and for free on PC.